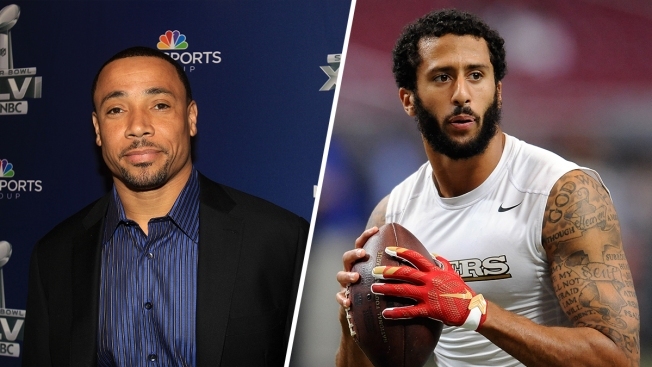 Rodney Harrison came under fire after attacking Colin Kaepernick as not Black enough to speak out against African American issues. Of all the criticism 49ers QB Colin Kaepernick has received for his public stance against the National Anthem in recent days, perhaps the strangest came from NBC football analyst Rodney Harrison, who said during a radio interview Tuesday the biracial QB wasn't qualified to speak on issues affecting African-Americans. "I tell you this, I’m a black man. And Colin Kaepernick, he’s not black. He cannot understand what I face and what other young black men and black people face, or people of color face, on a every single (day) basis," Harrison said during an interview with a local sport talk show in Houston. "I’m not saying that he has to be black," he said. "I said his heart is in the right place, but even with what he’s doing, he still doesn’t understand that we face as a black man or people of color, that’s what I’m saying." Harrison's remarks drew swift criticism across social media, including several posts from ESPN host Sage Steele, who slammed Harrison's remarks as a "racist, ignorant double standard." Steele, who is biracial and has three biracial children, has spoken previously about the challenges she's faced being a woman of mixed heritage. Oreo Milkshakes on a school night. Getting crazy. "I’m experiencing stereotypes even to this day, from both sides," Steele said during an interview with The Huffington Post. "Sometimes it’s even tougher — and the words and comments are uglier — from black people … I can’t tell you how many times I’ve been called a sellout for marrying a white man and for having kids that look white." Harrison later apologized, saying he didn't realize Kaepernick was biracial.